Hosted historically-themed walks, talks, and historical dramatic performances in and around the Park. Organised a History Exhibition in Shirley Parish Hall (May 2009). Started the Shirley Heritage Project, with HLF funding, to record oral histories of people’s memories of the local area. St.James’ Park history featured in double-page article in the Daily Echo (17th October 2009 – see our Press page). Extended the History Pages on our website to include Your Stories (2009). Organised an initial series of public history talks as part of the Shirley Heritage Project (October 2009 to March 2010), followed by four further series (October 2010 to March 2011, October to December 2011, October to December 2012, October to December 2013). Organised Group Tours to Southampton City Council Archives and Local Studies’ Library (December 2009 & January 2010). Contributed to Southampton City Council Conservation Team’s “St.James’ Road Conservation Area” document (2009). Established the FoSJP History Research group for local people interested in local history (April 2010). Produced a series of FoSJP “Shirley Heritage Project Newsletters” (March 2010, October 2010, April 2011, April 2012, October 2012, April 2013, October 2013, April 2014). Taken the FoSJP History Display to local schools (June 2010, June 2013), a local residents street party (July 2010), the Southampton History Fair (April 2011), the Foyes Corner Festival (May 2011), and the Shirley Women’s Institute (February 2012). Organised Make Do and Mend, a series of craft and sewing classes with the aim of passing on skills and memories from older to younger generations (October 2011 to July 2012). Organised an educational Medicinal and Edible Plants walk and talk in St.James’ Park (July 2012). Held a Tudor Costume workshop to support Southampton’s Tudor Revels project (September 2012). Held an educational workshop for children at St.James’ Park (May 2013). Held an Oral History Project workshop at St.James’ Park (February 2014). Organised an Edwardian Photography Studio event at St.James’ Park (February 2014). Hosted a special Afternoon Tea for Oral History Project interviewees at the ParkLife Café in St.James’ Park (April 2014). Visit our History pages to find out more about our history‑related activities. A “Reminiscence Day” event to encourage people to share their memories of the Park and its surroundings (May 2006). Wildflower and bulb planting events to improve flora within the Park (October 2006, May & October 2008, November 2012). A clean-up morning to prepare the Park for winter (November 2006). An “Art in the Park” event to encourage creativity (March 2007). A “Park100” event to celebrate 100 years since the Park was purchased for public use (July 2007). BBC Breathing Places-related events to inform and enthuse people about local wildlife (March & October 2008). Family fun and sports events, including a celebration of FoSJP’s first birthday (May 2007, July 2008, May 2009, April 2010, October 2011, April 2012, August 2012). Participation in the nationwide “Big Lunch” event to bring people in the local community together (July 2009). An environmental awareness event organised by younger FoSJP members (October 2009). Easter celebration events (April 2010, April 2012, April 2014). A “Start in the Park!” event to mark the start of restoration and improvement works in the Park (July 2010). A “Play in the Park!” event to celebrate the re‑opening of the Park after completion of the restoration and improvement works (July 2011). A tour of the Park as part of the Southampton Over 50’s Festival (August 2011). Hosting the Salisbury Big Band as part of the Southampton Over 50’s Festival (August 2011). Free Bicycle Checks & Repairs (April & September 2012). “The BIG Event” (July 2012) to celebrate the first anniversary of the re‑opening of St.James’ Park. A celebration of Diwali Week – Festival of Lights (November 2012). A Craft Workshop (February 2013). A “Plant Party in the Park” event to celebrate the coming of summer to the Park (June 2013), including an expert‑led Wildflower Walk & Talk. A two‑day Community Games event, inspired by the London 2012 Olympic Games, to bring the local community together to take part in sporting and cultural activities at St.James’ Park. 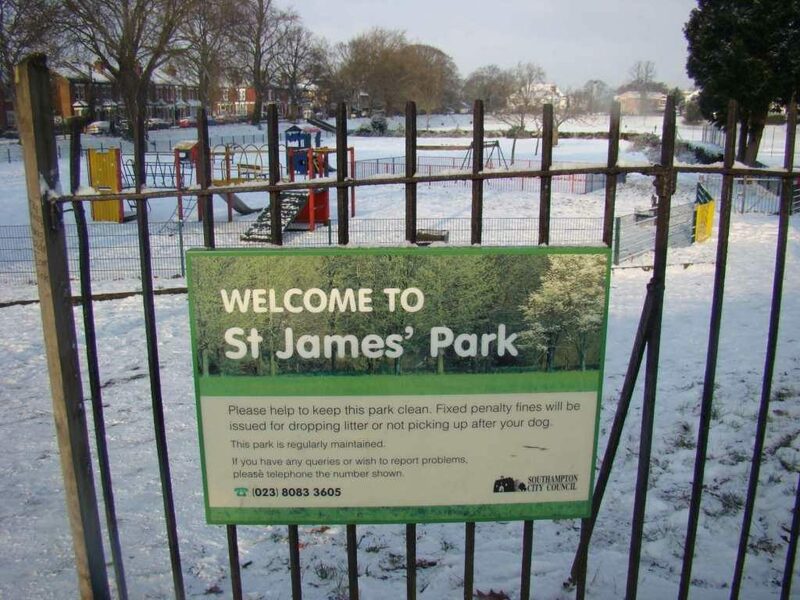 Launched Friends of St.James’ Park as a voluntary organisation in 2006, with a written constitution and an elected management committee. Established a membership base of over 450 people – the largest group of its type in Southampton. Established a regular Newsletter to all members to keep them in touch with Park news and events. Launched the FoSJP website (October 2006). Launched the FoSJP Facebook page (November 2010). Established ParkLife Community Interest Company (ParkLife CIC) in November 2010, to run the ParkLife Community Café on behalf of FoSJP and the community after completion of the restoration and improvement works in the Park. Visit our FoSJP page for information on becoming a member of FoSJP. Established a good working relationship with Southampton City Council. Become a member of Southampton Voluntary Services. Together with SureStart, supported Jamie’s Playtime summer activities for pre‑school children in the Park. Set up a FoSJP History Stall at the Bitterne Local History Society‘s History Fair (March 2009). Organised teaching events in St.James’ Park for children from local schools. Supported a student project within the University of Southampton‘s History department (February to May 2010). Advised several new friends’ groups setting up in Southampton. Supported the Coxford and District Youth Project‘s work with local disadvantaged young people. Worked with the Southampton City District Scouts to put on a two-day Community Games event at St.James’ Park.